Landreth Seed is one of the oldest seed houses in the country. They specialize in older seed varieties. They do carry some newer hybrids but we never get those. I follow them on facebook. Almost daily they post about a vegetable or flower and offer growing tips. The other day the tip was about growing leeks around here: plant the seeds now. Tiny wisps will appear this fall and then next spring they will take off. Not harvested for almost a year, we will cover the bed with a floating row cover to try and stop weeds. Landreth is a local company. They are in New Freedom PA and have a store front. Right now the shop is filled with onion sets, garlic starts and a wide selection of flower bulbs. I asked for my leek seeds and they showed me an option: 4 ounces. Looked good to me. Homer has a method of planting that allows for spacing on centers, filling a bed from edge to edge and cuts way back on weeding. Yesterday he put in 1200 leek seeds. And did the chores and prepared chickens for delivery today too. When we calculated that 30 leeks for each of our 40 CSA members is probably enough, we looked back at the bag I had purchased. We needed a thimble full, and I had about a cup. Oops. 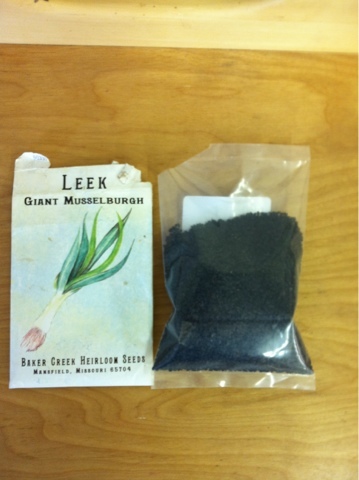 Anyone want to buy some of my extra leeks seeds? Good deal on them. And we already had a seed pack anyway.